Size: SmallMediumLarge Color: Assorted BrightAssorted CalmBlackRed/Red/GreyBlack/Red/GreyBlack/YellowBlue/Grey This item is currently out of stock! See bottom of page for Weight and Sizing specifications. Made when ordered here in our factory in Portland, Oregon, and winner of the Guides Choice Award! and Alpinist Mountain Standard awards, CiloGear WorkSacks are the best packs for climbers in the world. 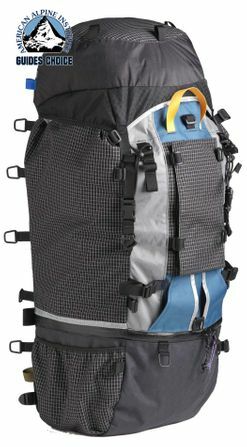 The 75L is a specialized carrier for heavy bulky loads on big expeditions. During R&D the 75L WorkSack quickly caught on amongst guides working big mountains on Denali and Cho Oyu. Carry Big Loads, Not a Heavy Pack! The 75L pack is a step beyond from our regular WorkSacks. In order to comfortably carry the heavy loads of high altitude mountaineering and long, unsupported backpacking trips, we improved several parts of the suspension. First, we used a new foam laminate for the shoulder straps and the hip belt. We improved the load transfer of the Internal Compression Strap by integrating the Carbon Control Rod and a transverse stability strap to unify the suspension. The Carbon Control Rod is a protruded carbon fiber rod that arches across top of the pack. Tensioned by the internal compression strap, you pull the load off the front panel, onto the CCR. Simple, elegant and functional. A bottom zipper allows easy access to your very cold weather sleeping bag. The internal load transfer shelf separates the sleeping bag from the gear above. You can also use the internal load shelf to carry people: just open the zipper, put their legs down through and carry them off! Modular features include a Ninja Pocket, a removable framesheet with aluminum stay, the CCR, bivy pad, lid, sternum belt and hip belt. The strap set consists of 4 short simple straps, 2 long simple straps, 2 dual adjust side release straps that go all the way around the pack, and 2 long side release straps. Ladies, be sure to specify Women's Hipbelt. "Back from AK and LOVED the 75L WorkSack. Exactly what I have been looking for for 5 or 6 years." John Race, Vice-President of the AMGA.